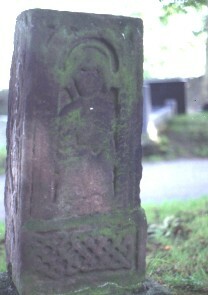 Cross shaft fragment, west view. There is a haloed figure under an arch, with interlace below. Collingwood, W.G., Northumbrian Crosses of the pre-Norman age 1st, Faber and Gwyer, London (1927) Crosses, Anglo-Saxons, Northumbria, England..